It’s time for us to get a farm, not a huge farm just a small bit of earth. You know how you just know and we know. Once we open the door to this possibility all sorts of wisps of opportunity will usher in. Where will this dream of sustainable living take us? I don’t know if it will happen in one year or five but it’s coming. I would prefer that we build our own house that has passive solar and is also wind and water powered. It could even be an earth home but that might be tough being so close to the ocean. Other than that it can be very simple but I would like to have a few modern conveniences. We need land to raise chickens, hogs, goats, meat chickens, rabbits, and of course our bees. This would not be a quick transition it could be one that takes years but it is so important to get a clear vision of your dreams so here is mine. As I get closer to this dream I will post more and more details of this vision….this is just to get the ball rolling. I think mulling over the details is important so as we get closer to this dream we will know it when we see it. What do you think? Do you already homestead a small patch of land? Do you have any input or advice to offer us? I would love to hear from you. Keep on Dreaming to all of you who are like me dreaming of your farm…. Heather it probably will be a while but I thought I would just put it out there 😉 I subscribed to your blog today! That might be asking for a bit to be in 20 min. 10 more to Burgaw and you’re golden. 🙂 We have actually looked in that area and they have some really nice property that way. Just not sure I’m ready to commit to heading inland. I want to get closer to the salty brine. Katherine……I found one actually out there but we are going to wait most likely until my youngest graduates…. We just bought our 5.5 acres last year to start our homesteading journey! We are so excited but unfortunately it did not come with an inhabitable structure (just a horribly deteriorated farmhouse), there were no barns or fences, it’s on a hilltop with no source of water (so no ducks), and the soil is a red clay hay field that needs work before we can grow anything! But the chickens and rabbits supply us with some organic matter and we compost everything so we are on our way. As long as you have a dream and don’t mind hard work it can happen. At least that’s what we keep telling ourselves! Best of luck from our little beginning homestead in WV! Jennyerin Wow you have found the dream! I have renovated 2 houses already this is the only thing I really don’t want to do as part of the dream. While I loved it I know how much work it is. But it sounds like you have such a positive attitude. By the way my first house I renovated was in Frederick County, Maryland probably you have heard of it! If you buy land without a house, maybe it could be zoned agricultural so you can pay less taxes. That might make it easier to start some stuff now like a small outbuilding and put bees on, and really plan for later, since you will get to know the “lay of the land”. I was going to ask if you use Pinterest? I just started to use it to get ideas for what I want in the future. To me it is my online vision board. Great ideas! Yes I do use pinterest, I love it another addiction besides blogging 🙂 I have a follow me button on the right hand side but my pinterest name is lilsuburbanhomestead. I will look for you…are you under your blog name? Thanks so much! I think great minds think alike anyway 🙂 It is ironic that to obtain a home with less environmental impact is so much more difficult but a worthy dream to be sure! ideed, it is ironic. it’s actually more work to live green and sustainable. it’s so weird how people have separated from the nature these days.. I know….pay more to leave less of a footprint on the land……..unbelievable! We live on 13 hilly acres. Sadly, half of that land is bisected by a deep, muddy ditch. We can only get heavy equipment (such as a small tractor) to it during certain dry months of the year. So if I were doing it again, I’d look for a place where you can get whatever equipment you are using to all parts of the land whenever needed (or at least most of the time). You might also consider buying more land and putting about 5 acres of it into hay, if any animals you raise eat hay. I’m not saying to buy haying equipment, just the land. This land would need access (very wide gate, if fenced). Then you can hire a local farmer to plant seed for you and bale the hay for you (much cheaper than buying hay elsewhere and you know the content, because you bought the seed and managed the land). Just an idea to think about…. Wow Susan you have some great ideas I have never even thought about because I am only a wanna’ be farmer at this point! I have so much to learn about land and raising larger animals……Having this blog and conversation is such a cool thing because I only have to refer back to this dialogue. Thanks so much for stopping by too! Hope to see you again! I love the photo it is a physical representation of what I want too! We are in $200,000 debt (including 130,000 in 2 mortgages) despite my husband earning darn good money in the oil field. I set a budget based on one income to pay down the debt in 3 years. The 3rd year we’ll sell the house, live in the RV fulltime, and look for land 20+/- ac. outside of Casper to try to take advantage of USDA rural development loan. Then we will build a strawbale house, other structures, and I’ll be doing the small homestead farming/small livestock care while he continues to work. Good luck with your dreams – don’t let them fall by the wayside. If there IS a way to do it sooner – figure out if the “sacrifices” are worth it, like we are doing. 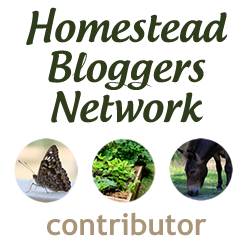 I hope you blog about your strawbale house I have always thought about doing one of those too. Thanks for the encouragement sometimes things seem impossible so thanks for inspiring me! 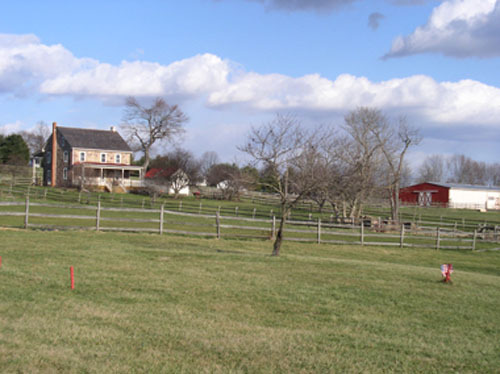 By the way isn’t that farm just beautiful….I bet it is up in Maryland or Pennyslvania I stumbled across it and just thought amazing! We have 3/4 of an acre. We have a garden and chickens on it. This summer we will be adding a goat to help with the weeds. Our dream was to have 2 acres,but now my husband has up the dream by 3 more acres. Works for me. Michelle wow it sounds like you do so much with your 3/4 of an acre. I don’t blame your husband for dreaming of more! Thanks for stopping by! Hi. I am on a one acre micro farm in central NC. I have figs, blueberries, heirloom roses, 8 free ranging chickens, two goats about to kid and give me milk (! ), an herb garden and a vegetable garden. And we aren’t even using all our land. Yet. : ) I’m also homeschooling two children. One day I hope, like you, to move to a bigger farm. I hope to try bees as well as pigs. Isn’t farm life wonderful? I will definitely have to come over to your blog! 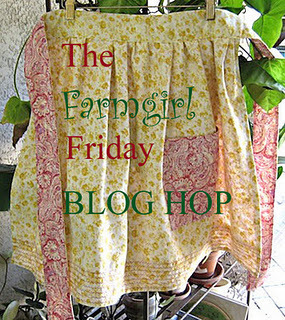 Sounds like you have a lot of wonderful homesteading plans taking place! I homeschooled both of my children for a while a worthwhile pursuit to be sure! I love my herb garden too! Hope to see you again soon! Sheryl the dream shed/barn sounds amazing! Maybe we can share this dream and journey together 🙂 See you soon! I love that word, farmette! That is what we dream of as well. We have a couple acres, but it is smack in the middle of our little town. Good luck with your goals! Kelly I have always wanted a farmette but just didn’t think we could swing it but I am going to follow my dreams! I used to live smack in the middle of a small town and loved it but didn’t think they would like it if I raised goats 😉 Thanks so much for hopping over here! It’s so important to write down your goals. We, like you, are watching for that next door to open to allow us to start our farm. Best wishes to you! Daisy I agree wholeheartedly! Writing down my goals and dreams also helps me see them take shape slowly but surely. I hope your farm is right around the corner….and we can start our journeys together 🙂 Thanks for your inspiring comment! This is a wonderful dream! I’m sure you’ll make it happen oneday, and it will be so worth it! Debbie thanks so much for your encouragement and stopping over here and I am planning on making soup this week I need to stock up the freezer again! Love your Sunday night Soup blog! I love that you wrote your dreams down…..I started doing that a out a year ago. I get weepy thinking about wanting my own farm/homestead/farmette, and more so when others have the same goal…it tells me that it is a worthy goal to keep dreaming of. It’s ironic to be in America….where homesteading has been our heritage and yet today it seems harder then ever. Keep dreaming, I’ll add your dreams to my prayers! Renee what a touching comment…..you know I just got done reading the book “Folks This Ain’t Normal” and I love that you got weepy because corporate america has us convinced that we can’t do things as good as them and we can and we can reclaim our land! Thanks so much for stopping in! My dream is the same. I am dreaming of a small homestead on a glacial fed river that runs all year long. (lots of rivers out here dry up before it gets really hot in summer) In a better USDA hardiness zone than I have now at 4,000 ft elevation. I’d like it a bit warmer earlier and longer each year… You are in my thoughts and prayers for a happy homestead dream fulfilled. Hubby and I have been talking about it for years, but we’re ready to DO something!! We hope to have our house ready to put on the market by May. If it sells, we will take it from there. I’m SO excited to buy a piece of land and get out of all this concrete and noise! I love seeing we aren’t the only ones with this dream. Dafne it is so encouraging to know I share my dream with others who are like minded it is definitely very encouraging! I so hope your house will sell quickly! Thanks for visiting! Best of luck reaching your dream! We are on four tenths of an acre in town. For now I will have to settle for chickens and maximizing my food production on the space I have. Oh, how I would love to have room for English walnuts, more fruit trees, and maybe a couple milk goats.